Beautifully engraved Certificate from the famous Lion Match Company issued in the 1960's. 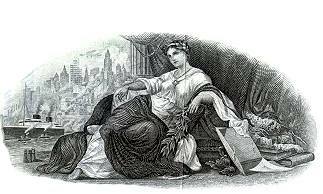 This historic document was printed by the Central Banknote Company and has an ornate border around it with a vignette of an allegorical woman sitting with a cruise ship and city in the background. This item has the printed signature of Monroe Greenbaum and is over 35 years old. As recently as 1976 there were 23 prosperous American match companies. But the boom didn't last. 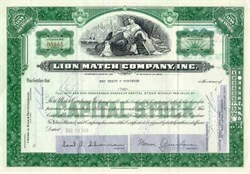 Today, there are only four American match companies: Lion Corp., Superior Match Co., Atlantis Match Co. and D.D. Bean & Sons Co.
A Lion Match Co. trademark for a matchbook contained match sticks printed with lettering, designs or a combination of both. The standard 30-strike size matchcover holds 21 wide stick feature match sticks; the 20-strike size matchcover holds 15.